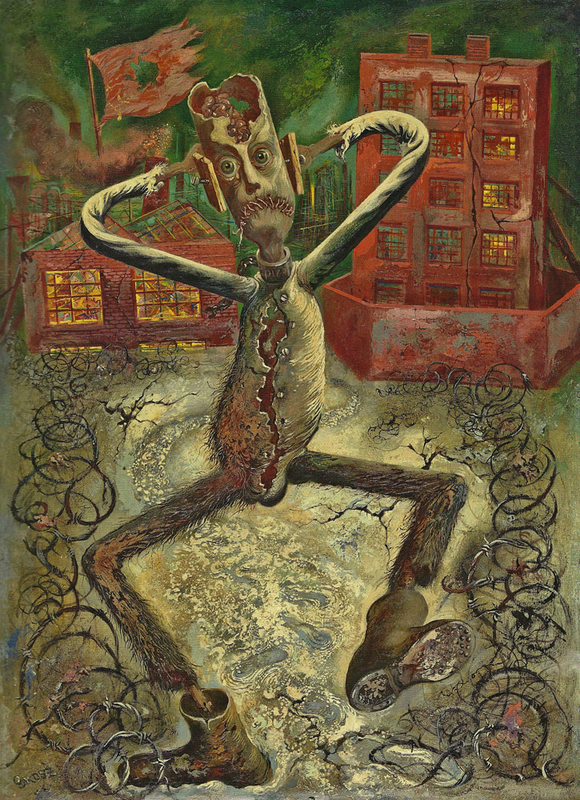 The Grey Man Dances (1949) is a rare and widely exhibited masterpiece by George Grosz, which was shown at the Whitney Museum of American Art (New York), the Neue Nationalgalerie (Berlin), and Centre Georges Pompidou (Paris). Since choosing to go into exile in the United Stated in 1933, Grosz had closely followed developments in Germany under Hitler, and he also captured the horrors of the war in his art. However, the great hope that the death of Hitler and the end of the war would improve the political situation in the world was dashed. Instead, it was too obvious that the Cold War could lead to a global atomic disaster. It was during this period that the “stickmen” – gray, empty, soulless creatures – began appearing in Grosz’s paintings. In the picture The Grey Man Dances, the stickman seems crazy; he dances the dance of the madman in a world totally gone insane. The figure’s stick legs are clad in worn fur and stuck into hobnailed boots, in which the stickman haphazardly runs across an ice-covered earth. The ears are nailed shut, the mouth is sew together, the top of the skull opened up, and the hollow body hastily mended. Inexpressively, the cold glass eyes stare into the distance. Still, this fragment creature – the spawn of a mad, grotesque world – appears to feel endless pain. No wonder: in the exploding factories in the background, the machines are running out of control, sparks shoot out of the chimney, and black smoke darkens the sky. The buildings seem to glow with the heat, the layer of ice cracks. The word is out of joint.